Cambodian students enter the courtroom before the hearings against two former Khmer Rouge senior leaders in the U.N.-backed war crimes tribunal on the outskirts of Phnom Penh, Cambodia, Nov. 16, 2018. 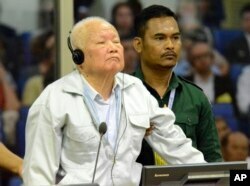 In this photo released by the Extraordinary Chambers in the Courts of Cambodia, Khieu Samphan, left, former Khmer Rouge head of state, stands at the dock in a courtroom during a hearing at the U.N.-backed war crimes tribunal in Phnom Penh, Cambodia, Nov. 16, 2018. The Khmer Rouge sought to achieve an agrarian utopia by emptying the cities to establish vast rural communes. Instead their radical policies led to what has been termed “auto-genocide” through starvation, overwork and execution. In this photo released by the Extraordinary Chambers in the Courts of Cambodia, Nuon Chea, who was the Khmer Rouge's chief ideologist and No. 2 leader, sits in a courtroom before a hearing at the U.N.-backed war crimes tribunal in Phnom Penh, Cambodia, Nov. 16, 2018. 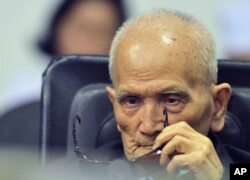 Both defendants were present as Judge Nil Nonn opened the proceedings, but Nuon Chea suffers heart problems, so was granted permission to later move from the hearing room to a separate holding room. A large crowd of spectators attended Friday’s session, including members of the Cham minority. Lah Sath, a 72-year-old Cham man from eastern Kampong Cham province, brought his wife and four young granddaughters to Friday’s session. He said he often heard people talking about the trial and sometimes watched it on TV, but decided it was time to see it with his own eyes. Cambodia’s long-serving, autocratic Prime Minister Hun Sen has declared he will allow no further case to go forward, claiming they would cause instability. Hun Sen was a Khmer Rouge commander who defected when the group was in power and was installed in government after the Khmer Rouge were ousted from power by a Vietnamese invasion. The failure to have more extensive proceeding has discomfited some observers, but others point to the tribunals’ accomplishments.